Making your dream of an outdoor wedding come true. Imagine saying your wedding vows amid a lush green backdrop, ducks swimming across the pond, and towering red cliffs. 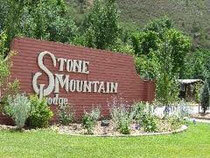 The Stone Mountain Lodge property offers a most unique outdoor setting for your special Colorado wedding. The ceremony area is on a manicured green lawn, with a vine covered arbor and a treed background. White wedding chairs are arranged in a semi-circle providing the most intimate setting. The Reception tent is custom designed to host a perfect outdoor affair with up to 150 guests. Outdoor elegance is provided with soft green carpeting, a wood dance floor and chandeliers. Tent sides with cathedral windows and curtains create a festive atmosphere while assuring the comfort you need. The garden area, bridge, and lighted fountain at the pond complete the private estate feeling. Situated on a scenic 45 acres, yet close to both Boulder and Estes Park, Stone Mountain Lodge & Cabins allows your out-of-town guests to enjoy the best of Colorado.